About 6,000 armoured vehicles 1947-2017. Under a new leadership the country was now narrowly linked to the line defined in Moskow, and in 1947 the Cold War was on, as events in Berlin degenerated quickly. The Warsaw pact also officially known as the Treaty of Friendship, Co-operation, and Mutual Assistance, was a reaction to the constitution of NATO in 1955. It was signed on 14 May the same year and Gathered East-European nations previously liberated by the Red Army, namely Bulgaria, Romania, Yugoslavia, Albania, Hungary, Czechoslovakia, East Germany and of course Poland, as the treaty was signed in its capital. This treaty and organization will be the black beast for NATO until 1990. It was at first the traduction of countries armed with the same standards in equipment, tactics and operating procedures. But as times goes by, some nations developed gradually their own production (license production and derivatives) especially industrial nations like Poland, Czechoslovakia, Hungaria, Romania. Tito’s Yugoslavia took a radical departure early on and never joined the treaty. 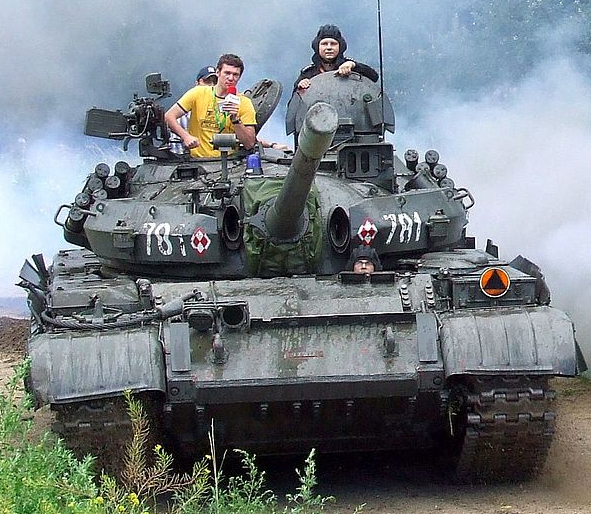 A Polish-built T-54AM. They had “L”-shaped fuel cells and additional ZIP stowage bins on either side of the turret. Although procedure and tactics were borrowed from Soviet Union instruction and defined also by similar equipment, the local industry soon found ways already in the 1960s to license-produce Soviet tanks for the Polish People’s Army. Indeed, 2,855 Polish T-54AMs were manufactured in the Bumar-Labedy from 1956 to 1967, differing by minor details for Soviet tanks. 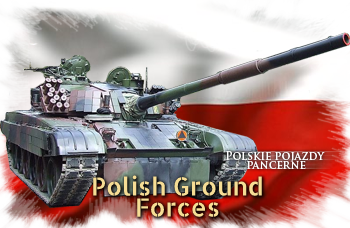 They formed the backbone of the Polish Army, replacing older T-34/85s. The 1980s political events were instrumental in Poland’s history as they certainly contributed to a loss of authority from Moskow and was one of the knockdown blows that bring the Soviet empire to collapse in 1989-90. The Solidarnosz (an independent trade union) movement funded 17 September 1980 at the Gdańsk Shipyard under the leadership of Lech Wałęsa came as a revelator of the will of independence that surged in many eastern block countries at large. The movement grew up to create massive strikes in 1988, and despite the reaction of the regime led by hard-liner Marshal Jaruzelski in ended in September when the local communist party was forced to recognise the movement as a political party of its own, and the next year the first national elections were organized in June 1989, which led to the victory of Lech Wałęsa (which became later the first president of post-cold war Poland and new Senate). The disintegration of the USSR later only confirmed both a full independence of Poland and its opening to the West. In all these events, the Army seemed neutral, although subjugated by Marshal Jaruzelsk an , intervention was feared but never appeared as it seemed no order were given to make a “crowd-control” in the old Soviet style, with tanks rolling in the streets and over barricades. In the following years, the Army was left with an obsolescent, massive park of AFVs and little funds that imposed a deep re-organization. IS-3 Poland only received 2 IS-3s for testing and never introduced the type into service. However, one is kept at the Polish Armor Museum, having a marking with the Polish eagle. T-54 Here a Polish-built T-54AM. These were produced by the thousands, and had significant differences, two locally-designed “L” shaped fuel cells (left fender), modified right rear air intake, different tool box storage, new rotating turret floor, and modified hydraulically assisted drive’s controls. Most were exported. T-55 Also built under licence in Poland. Modifications includes the T-55AD command tank (161 km radio range), T-55L (local T-55A) and T-55LD (rebuilt T-54), T-55AD-1 & 2 (A command tanks with additional radios). In the 1980s a second wave of modernizations concerned the T-55AM “Merida” (Sub-variants: T-55AMS, AD-1M & AD-2M command). Others includes the S-125SC “Newa-SC” SPAAML, WZT-1/2 ARV/CEVs, IWT is the standard dozer/crane BLG-60 bridgelayer.